The waffle towels are done - and I've decided to move on. I left the old warp on the loom so I could tie on another set of towels - but I don't love this weave structure enough to bother. If I did another set, I'd just rush through them so I could get on to something else, and what's the point in that? 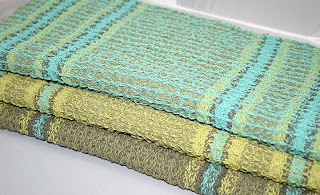 Especially when I found a pattern for overshot placemats that uses the same fiber I was going to use for the towels. Overshot rules!